Here and now, the ongoing digitization is changing our health care system. Today’s possibilities of data integration, interpretation and interconnection lead to digital knowledge acquisition that makes the long-term vision of personalized medicine a reality. With the help of existing and rapidly evolving digital instruments, medical quality is already better – because it is more measurable, more comparable and more transparent – than ever before. And it is exactly this quality that will continue to improve. The prerequisites for individualized and patient-centered treatment and a targeted prevention are now given more than ever. With CentraXX and the constantly developing CentraXX software product family, a real knowledge portal and expert system for treatment and research is available right now. This means that isolated specialty solutions are finally a thing of the past. Now is the Time: Invest in a real growth market. The market potential for IT solutions in the healthcare sector is massive. University clinics, research institutes and pharmacological and biotechnological companies are the main target group of our customers. In Germany alone, this means more than 1,000 potential customers (35 university clinics, 600 research clinics, 100 private research institutes and 500 Biotech companies). In the USA there are more than 260 medical faculties, 1,000 hospitals and over 1,000 biotech companies. Fragmented IT landscapes are widespread in US research institutes. The market for modern, flexible and validated IT systems for researchers is huge. In the field of biobanking alone, »Visiongain« estimates a global market volume of 24.4 billion US dollars for 2017. The number of clinical trials is also increasing rapidly. Professional solutions for documentation and analysis, such as those already offered by KAIROS with CentraXX, are constantly in demand. Amusing money ideas are up to other people. In recent decades, the market for biobanking and study management targeted by KAIROS has gained a significance of its own. In the course of the completion of the Human Genome Project, it has become increasingly accepted that biobanking is less a cost-driving add-on to pathology, but can be expanded into its own profit centre in addition to its scientific and clinical significance. The best economic position in drug development and clinical treatment will depend on successful biobanking to a large extent. On the one hand, biobanking is attributed a key role in the discovery of new biomarkers and new active substances, and on the other hand, as already mentioned above, biobanking plays a vital role in personalized medicine. With this changed meaning of biobanking, a completely new market has emerged in the intersection of the previous health system. Under the keyword of the holistic approach “From-Bench-to-Bed” a convergence of clinical routine operation with research can be observed. And the actual “just-in-time revolution” in the relationship between research and treatment, which is essentially determined by a software-driven biobanking 3.0, is still to come. With CentraXX, KAIROS offers a biomedical research portal that has already incorporated the principles of personalized medicine into its product DNA. The CentraXX research portal focuses on the structured capturing of research content through the biobanking and study management modules. In particular, the connection to the treatment data is established by means of a comprehensive data capturing pipeline. The provision of treatment data for research in particular reveals new contexts of meaning. Thus, important findings – such as the comparison of patients with similar cases – can be offered via the portal. Features such as age, diagnosis, therapy, pathological descriptions and laboratory values are no longer sufficient to compare diseases in the context of personalized medicine. Therefore, a research portal must integrate the OMICS procedures. IT-supported predictions and therapy suggestions can then be made from this symbiosis. For this reason KAIROS has also implemented a certified QMS according to DIN EN ISO 13485 for the development of medical products. Research data can only be returned to the treatment process via this path, which is specified in accordance with DIN EN ISO 13485. And this loop is the cornerstone of promising personalized medicine. 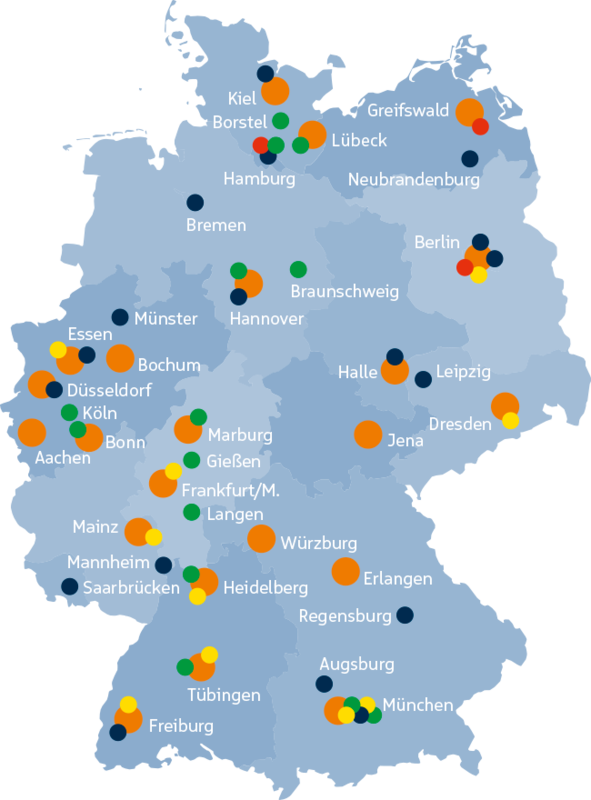 CentraXX is already in use in 30 of the 35 university hospitals in Germany. 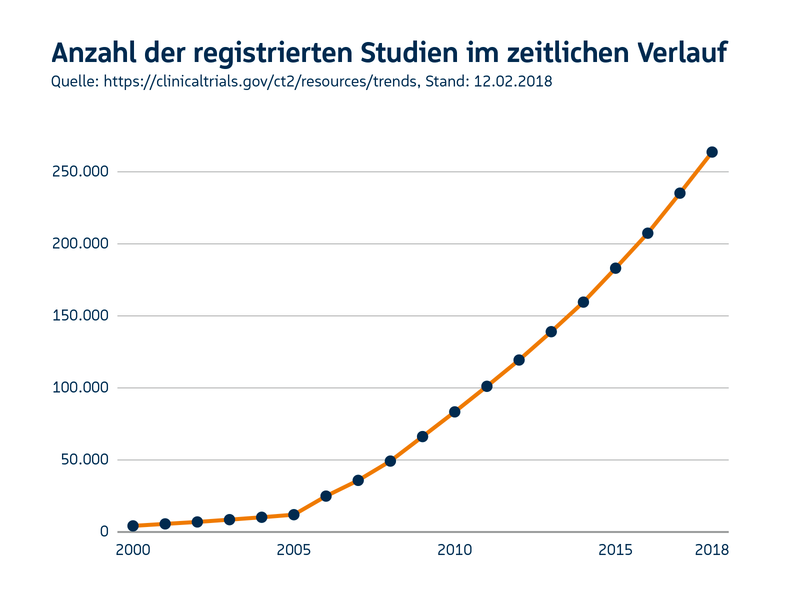 In addition to the largest long-term study in Germany, the NAKO Health Study (NAKO), three of the six German Health Research Centers (DZG) and numerous other renowned research institutes are already taking advantage of CentraXX. What sets our IT solution apart. 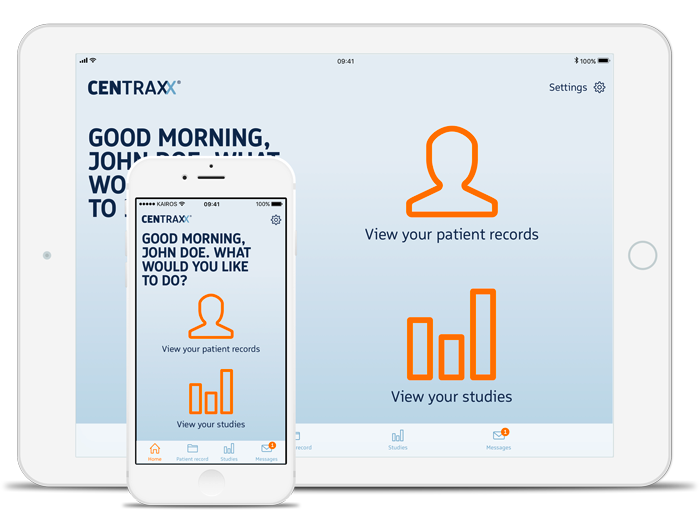 CentraXX is a patient-centered solution. All data collected in a patient’s medical history can be contextualized. CentraXX is a flexible system. The open XML interface enables the import and export of all data fields within the solution. CentraXX is not able to perform the most specific and specialized tasks or documentation, but CentraXX can always be used as a collector of all relevant research data from different sources. Many providers offer very restrictive solutions that are not very well suited for embedding in an existing and highly complex environment. CentraXX does not aim to replace all other systems, but rather proposes to end the isolated approaches by putting all relevant data into a common pipeline that can be made available for statistical analysis. CentraXX also offers the possibility of data capturing. The integrated workflow engine enables the adaptation of streamlined and orchestrated work processes into rule-based processes. All types of protocols and standard operating procedures can be incorporated into the system to enable data acquisition in almost all laboratory environments. We train our customers to configure their own solution independently by giving them access to the workflow engine and other modules within the solution so that they can operate their own solutions independently and are not forced to contact us for any changes to the software. We offer CentraXX on the basis of a concurrent user license. The solution has a modular structure and can be tailored and individually bundled to meet the needs of companies of all sizes. The implementation of CentraXX is offered as a cooperation project with our customers, as the development of complex solutions for the healthcare sector and their adaptation to individual needs requires professional support. We have thus created the opportunity to offer professional services and consulting in addition to the distribution of software. In addition to deploying the solution in the customer’s environment, we can also host the solution as a service in the cloud. This allows us to sell temporary access to smaller companies that cannot afford to build their own IT infrastructure but want to use a professional solution to collect and analyze their data. This model will become increasingly important over time as a large trend towards outsourcing IT resources can be observed today. KAIROS – the awarded hidden champion from Germany. Since July 2017 the quality management system of KAIROS has been certified according to DIN EN ISO 13485. This certification covers the scope of development, installation, service and distribution of software to combine clinical and research data to set up and support an expert system. This is a major step on the road to FDA approval, which in turn is the basic prerequisite for a sustainable market success in the USA. The size of the ideas does not depend on the size of self-portrayal. KAIROS GmbH is an IT specialist with more than ten years of experience in the development of IT system solutions for the healthcare sector. In addition to special technological knowledge in the implementation of medical middleware platforms, we have extensive know-how in the IT-supported orchestration of workflows via workflow engines. This not only sounds good, but also reflects the demands and reality of KAIROS. Launched as a classic “start-up”, the size and market share quickly corresponded more to a “grown-up company”. Puns and noises – today KAIROS is a real hidden champion who, as usual, is determined and committed to the ambitious goal of being “innovation leader in the field of medical research IT”. 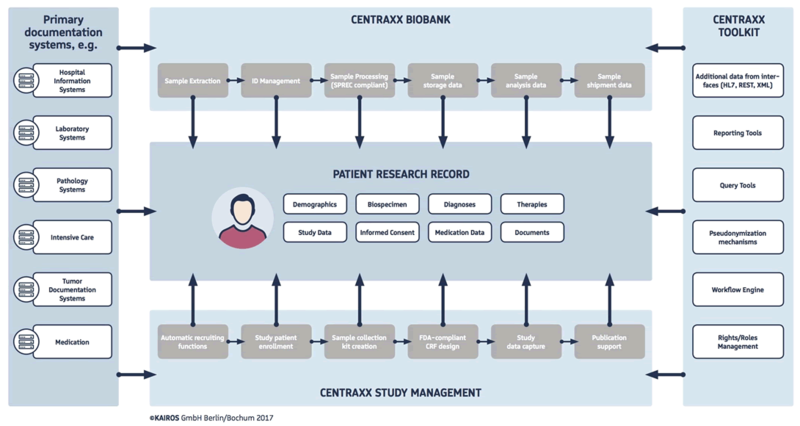 Especially in the areas of preclinical, biobanking and study management, our CentraXX product solution is a unique knowledge portal that covers all current requirements and is adapted and constantly expanded in line with the current requirements. We offer comprehensive IT-based portals tailored to the needs of medical researchers. Today, many researchers are no longer able to collect high-quality data in validated and user-friendly systems in compliance with strict data protection regulations. With this comprehensive portfolio and our own research activities, we have indeed established ourselves as a pioneer in recent years with regard to the current requirements of our clients in biobanking and study management. We are also continuously developing our range of services to meet future requirements, for example in the expansion of existing topics and in preclinical research. We are involved in numerous research projects in the biomedical research environment. Among other things, we have developed a new approach for the quality-assured execution of preclinical studies according to SOPs with a study editor – we combine multi-centre workflows and simultaneously implement the demand for a patient-centered approach. In addition, we have developed a patient app that enables the flow of data between treatment/research institutions and their patients/probands who no longer need to track their health information – often only on paper (if at all) but where they should be today: at the tip of their fingers on their smartphone. The app becomes a matching platform – the interface between patient and research and/or patient and pharmaceutical industry. Of course the patient should be in charge and decide on his own with whom he shares his data. It’s like on the pitch: It’s the team that matters. KAIROS was founded in Bochum in 2008. Further development and sales offices are located in Berlin and Boston. Kairos employs 40 people in the fields of bioinformatics, molecular biology, computer science and law. Kairos employs seven PhD students. Our team brings not only years of experience in the healthcare sector, but also a real desire to change the way things work in healthcare today. We want to do better by providing strong IT tools that support the path to truly personalized healthcare. We are confident that we have found and built approaches and tools that are replicable for the world market. KAIROS has already won »KfW« and »Seed Capital Dortmund« as investors in the ERP start-up fund. KAIROS successfully completed a multi-stage evaluation process. If you are interested as an investor in not earning your money in just some way, but want to help shape the future of medical care, we would be happy to inform you about interesting investment opportunities at KAIROS. In this case, please contact Martin Zünkeler or PD Dr. Christian Stephan.